After 5 seasons of Friday Night Lights, the show has a massive fan base. The show is based off of the movie, which came out in 2004. Because it streams on Netflix, the loyal fan base can watch the show whenever and how many times they want. The fan culture has lived on after it’s final season with many fan pages across the web. Friday Night Lights has proven to have one of the biggest and most loyal fan bases. The loyal fans saved the show when NBC thought of cancelling. The Network intended on cancelling the show after its second season due to low ratings. 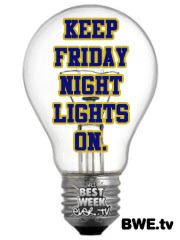 A Facebook page titled “Save Friday Night Lights …CLEAR EYES, FULL HEARTS, CAN’T LOSE THIS SHOW!! !” was created in efforts to protest. Fans rallied and eventually got the network to keep the show on air. Fans also sent light bulbs and eye drops to the network. The light bulb idea was set up by VH1’s show Best Week Ever (Blagg, 2008). The light bulbs were meant to represent the actual “lights” in Friday Night Lights and the eye drops were meant to represent the phrase “Clear eyes, full hearts, can’t lose.” An online petition received over 30,000 signatures in efforts to keep the show alive. Savefridaynightlights.tv (which no longer exists) collected donations for plastic footballs to send to NBC. A portion of the footballs and money were donated to anysoldier.com. After the fans’ campaign to keep the show alive, NBC kept FNL on their network and also allowing a partnership with Direct TV (“Fans Eagerly Taking,” 2008). The fans played a big role in keeping the show alive. Although the last season ended in 2010, fans still discuss the show daily on multiple platforms. “Clear eyes, full hearts, can’t lose,” has been used in many places by fans. One of the most famous uses of it was by Mitt Romney, who used it as his campaign slogan. The hashtag #cleareyesfullheartscant lose is still used daily on Twitter even years after show was last aired on television. What is unique about Friday Night Lights is how it went under the radar by having poor ratings, yet still has a growing group of fans thanks to its streaming on Netflix since 2011. The fans of Friday Night Lights are the only reason the show lasted for 5 seasons. Fan participation has made its impact on other shows as well. Other shows who stayed alive because of their fans include: Jericho, Chuck, Arrested Development, Roswell, Cagney and Lacey, and Family Guy. This means that poor ratings don’t always mean that the show is a failure (“7 Most Successful,” 2012). Friday Night Lights wikis are also popular. Wikis like this one encourage fans to add their own content by writing articles, uploading photos and starting conversation. Currently there is a poll that asks who the fans’ favorite character is on the show (Smash Williams prevails). There are over 180 pages of fan generated content so far. Along with a page for the show in general, each main character has there own wiki as well. Another popular way fans interact with the show is creating fan fiction. This website allows fans to come up with their own story lines using the characters from the show and creating new ones. There are over 500 pages of fan created content on this page. It is a creative way for fans to use their favorite characters to create their own content and to keep their Friday Night Lights experience alive. One fan added a female character to season 1 that Jason Street meets at the rehab center. Fan fiction allows for fans to be creative and enjoy each other’s ideas. The website is still updated frequently, despite the show’s last season ending in 2010. Quadriplegic characters are well developed and accurately portrayed in Friday Night Lights.